During the zygotene stage of meiosis, chromosomes huddle themselves up and telomeres cluster at a limited area of the inner nuclear membrane. This polarized configuration of chromosomes looks like a bunch of flowers, so it is widely called the “chromosomal bouquet”. Chromosomal bouquet formation is a highly conserved meiotic event in eukaryotes, which plays an important role in homologous pairing and therefore progression of meiosis. In recent years, some essential factors participating in bouquet formation have been identified in yeasts and mammals; but they are not conserved across species. So far, the underlying molecular mechanism in plant species remains largely unknown. A new research led by CHENG Zhukuan from the Institute of Genetics and Developmental Biology of the Chinese Academy of Sciences (CAS), showed that ZYGOTENE 1 (ZYGO1), a novel F-box protein in rice, modulates bouquet formation to efficiently promote homologous pairing, synapsis, and crossover formation in rice meiosis. Based on a genetic screen for sterile mutants in rice (Oryza sativa), they identify ZYGO1, a novel protein that functions to regulate bouquet formation during early meiosis. The zygo1 mutants show failure in chromosome aggregation and telomere clustering, resulting in the absence of typical zygotene-stage meiocytes. Genetic analysis showed that the zygo1 mutants can suppress telomere clustering in the recombination-deficient mutants, such as homologous pairing aberration in rice meiosis 1 (pair1) and rice completion of meiotic recombination (Oscom1). Immunohistochemistry showed that the polarized localization of OsSAD1, a SUN-domain protein promoting telomere movement, is also altered in the zygo1 mutants. All of these results suggested that ZYGO1 plays an essential role during bouquet formation. 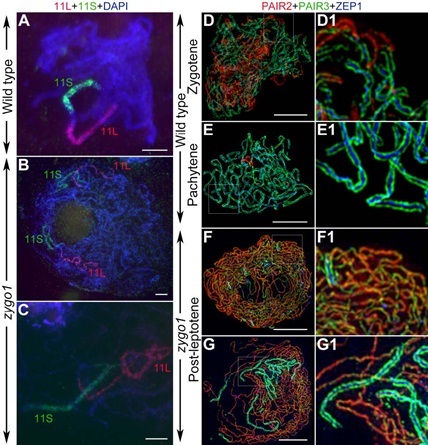 They also found that ZYGO1 regulates chromosome morphogenesis independent of double-strand break formation and repair. In addition, the suppressed chromosome clustering in zygo1 mutants further impacts homologs pairing, synaptonemal complex assembly, and crossover formation. ZYGO1 encodes a new F-box protein, containing an F-box domain with some conserved residues. Their results showed that ZYGO1 interacts with the rice SKP1-like protein 1 (OSK1) through its F-box domain, suggesting that ZYGO1 modulates bouquet formation as a component of the SKP1-Cullin1-F-box complex. This investigation lays important foundation for uncovering the molecular mechanism underlying chromosome clustering during meiosis. This study entitled “The F-box protein ZYGO1 mediates bouquet formation to promote homologous pairing, synapsis, and recombination in rice meiosis” has been published online in Plant Cell (DOI: 10.1105/tpc.17.00287) on September 23rd, with ZHANG Fanfan and TANG Ding as the first authors. This work was supported by grants from the National Key Research and Development Program of China and the National Natural Science Foundation of China.